The Phantom Zone is preparing to open, and there seems to be little that the Justice League (JLB) can do about it. Superman is within the Zone, and yells for Batman to wake up. Batman responds in the nick of time, and the portal to the Phantom Zone remains shut. The Flash takes Batman and makes off with him, rationalizing that the best thing to do is to keep him as far away from the portal controls as possible. Batman leads a pursuing Superman robot out into the arctic desert, and defeats it with assistance from Aquagirl. The JLB returns to the Fortress of Solitude to deal with the rest of the remaining robots. Superman continues his battle with Jax-Ur, dodging strikes from Jax-Ur's energy gauntlet, and evening the field with a low-blow and laptop. Superman begins to overpower and overwhelm Jax-Ur, leading Jax-Ur to order his son to detonate the functioning Superman robots. Superman is horrified at the prospect of the JLB being destroyed by his own creations, but Jax-Ur restrains him, leaving little recourse as the robots begin the sequence to detonation. Story - 3: The story isn't the problem, and neither is the characterization, or pacing. It's the timing of the releases that have hampered this installment. 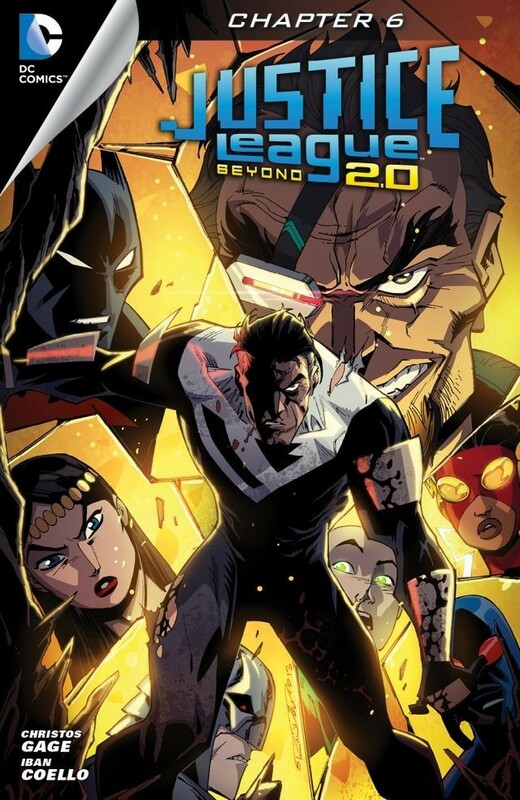 Frankly, Justice League Beyond 2.0 should be a weekly book. It's written as a weekly, and comes across better as a weekly. The bi-weekly schedule is a disservice to readers, and while Gage bears some of the weight of this problem, the decision to make the book a bi-weekly was not his. The story does move, and at an efficient pace, but the wait for the next installment is really unfair for a story that has been quite entertaining. Once more Superman is depicted in a familiar, yet fresh manner. Familiar in that he's recognizable, the core of the character is there, but fresh in seeing him act in a way that defies the current crop of Superman stories. Traditionally, when Superman loses his powers, he's a moving target until he gets them back. Not here. He continues to take it to Jax-Ur hand-to-hand, or knee-to-groin if you will, and the panel where Jax-Ur is cracked with the laptop is priceless. On one hand, it might seem violent or excessive for the Man of Steel, and the blood streaming from every other orifice is borderline overkill, but it's a good reminder, a necessary reminder of just how tough, efficient, and yes, super, this man is. He's going to find a way. He all ways finds a way. Even if he needs Apple or Lenovo's help. The rest of the league are light players, even lighter than usual, though it's good to see Aquagirl have her moment, after being seared and not much else. There are only two installments left, so the hope is that the JLB will get its moment as a team, which includes Superman, while Superman gets the same. Quite the trick. If there is one criticism I will lay at the feet of JLB, it's what will happen after this run closes. I don't expect Superman to head every issue; we could have just kept Superman Beyond for that. However, I am eager to see what can be done with other characters when it's their turn to helm the title, especially Captain Marvel, if only for an explanation of how his powers work, as there is some difference in what he's doing, as opposed to what he's done before. It may seem an unfair slating, but I'm really enjoying the title and hope they can keep up the good work past "Power Struggle". Art - 4: Remarkably solid and consistent handling, particularly for a digital comic, which can fluctuate from issue to issue. The things I like remain, while the things I don't irk me less and less. Cover Art - 3: Grim, man. Truly grim!